Ivan Buffa is not only the artistic leader of the Quasars Ensemble and at the same time performer, but also composer. Paradoxically his compositions only seldom sound at Slovak stages, although they are being performed at prestigious festivals at home and abroad. Therefore it is very much likeable, that two of his pieces appear in one of the concerts, altogether with a piece of another Slovak composer Jana Kmiťová from Prešov, currently living in Vienna. Quasars Ensemble is one of the most important propagators of Slovak music both at home and abroad. Thanks to its excellent performance the awareness of the work of the Slovak – Hungarian composer Alexander Albrecht, who worked in Bratislava, has been re-established. And once again one of his pieces will be presented. 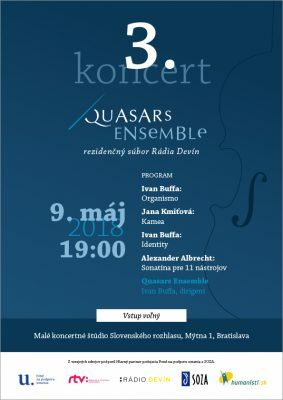 It is really a miracle that such an ensemble as the Quasars Ensemble exists in Slovakia. This year it celebrates the 10th anniversary of its tireless artistic activity. It is also well-known abroad, it is regularly invited to Poland, Hungary, Austria, to the Czech Republic to give concerts. Quasars Ensemble has gained international recognition through its participation at the International Music Festival in Darmstadt, where the musical world’s elite meets. Undoubtedly in the 10 years this ensemble has contributed to the musical cultural assets of Slovakia in a considerable extent. In April Quasars Ensemble came back from the International Festival of Krakow Composers – a part of the project VISEGRAD MUSIC IDENTITY (PL; Krakow) – where it also presented the contemporary Slovak production. The most important specific of this ensemble is that it brings to Slovak stages chamber ensemble pieces composed through several centuries. Authors are not only legends of international music, but also bards of Slovak production. 9th May 2018 at 7 p.m.